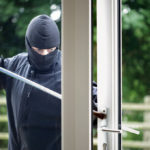 Keep your home’s surroundings well lit and shrubs trimmed – Crooks and their dark behavior tend to take place in low-lit areas or houses that have landscaping or privacy fences that allow them to hide out of sight until they have committed their crime. Head their nasty behavior off at the pass. Before your home becomes a target, light it up with motion detector lamps in the front, side, and back. Have a professional locksmith install a peep hole in your front door or use security cameras that allow you to see who is at your door or on your property before you are face-to-face with them by answering the door unaware. Keep Doors and Windows Locked – It may sound like a no-brainer to keep doors locked, but statistics prove that many burglaries occur through an unlocked or opened window. Be sure to lock windows and doors when you are home and when you are away. 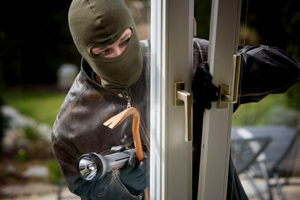 Simply remembering to turn those locks on your windows and doors will cut down on the possibility of danger. Shut Garage Doors and make sure they are secure – Next to open or unlocked windows and doors, another easy access point for intruders is through an open garage door. Many homes have a door that opens into their home through the garage. Even if the garage is a detached garage with no home entry possible, be sure to lock your vehicles at all times to avoid vehicle theft and to protect your automobile’s contents. Also, make sure the garage door you have is solid and secure. Older doors are often easy to open, so make sure your garage door is up-to-date. Lock down tools and outside buildings or sheds. There is no need to give a burglar any extra help. An unlocked backyard shed often contains gardening tools that you would otherwise consider harmless, but in the hands of the wrong person, they can be used to break into your home or worse, be used as a weapon. Have a qualified locksmith change your locks – When you move into a new home, go through a divorce, or are otherwise concerned there are keys floating around in the wrong hands, have your locks changed or rekey and get a fresh start knowing the key in your possession is the only one that will allow entry to your home. Don’t put your expensive belongings on display or give a clue you’re not home – Don’t give a burglar a welcome mat notice that you have household belongings worth stealing. Keep luxury cars out of sight and behind closed garage doors. Don’t put valuable items within view of windows or leave boxes to expensive gifts like television sets or other electronics sitting by the trash can on the curb. Be sure to draw the blinds and close the curtains, especially after dark when the house is lit up and easy to peer into. When out of town, arrange to have a neighbor pick up newspapers and mail so a potential stalker will wonder if you are home. Have a licensed locksmith install a home security system – have your home monitored. Have a deadbolt installed on all front and back doors. Hire a professional locksmith to assess what home security system is best for you and your home. Have the qualified locksmith install or repair your security system.